As you can see research is important. There are many ways you can help DRC to continue our important research. Learn more. 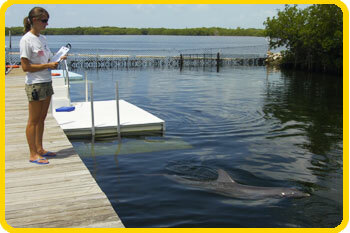 Studies of cognition ask how our dolphins and sea lions think. What are their mental processes? How are they intelligent? Without a shared language, it can be tricky to determine what is happening inside an animal’s mind. At DRC, we are able to design studies and train research games in order to ask these questions. Examples of cognition research include our “Less” study (showing that dolphins have the mathematical ability to compare quantities), our Object Permanence study (exploring what dolphins understand about hidden objects) and our Blindfolded Imitation study (showing that dolphins are flexible enough to use a new perceptual route to imitate [which no other animal has ever done!]). These types of studies not only contribute to the scientific body of knowledge about dolphins and animal cognition, but they also inspire conservation. When guests visit DRC and see Talon doing math, or Tanner imitating in such a clever way, it invites a new kind of connection with the dolphins. This connection can inspire more care for the species and the environment they live in. And when DRC publishes these studies and they are broadcast in the media, we take that connection around the globe. Behavior, simply put, is everything the dolphins do. How do they behave? How do they act in different situations? The trick to studying dolphin behavior is observing what they are doing in a systematic way, so we can determine meaningful patterns. At DRC, we have a unique opportunity to observe our dolphin family up close and on a consistent schedule that's not possible in the wild. Examples of our behavioral research include respiration rates (examining what dolphins' baseline rate of breathing is) and calf social development (exploring how calves become independent from mom as they get older). 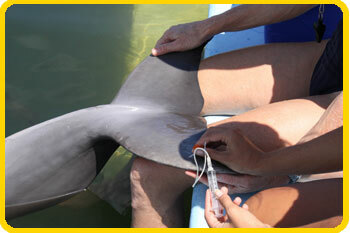 Studies of husbandry focus on the care and health of our dolphin and sea lion family. Dolphins and sea lions at DRC know a number of voluntary medical behaviors to help us monitor their health, take medical samples (such as blood or urine), and give them treatment when necessary. This is all part of their normal routine, because their well being is our top priority. Sometimes in the course of this, we discover something or develop a procedure that we want to share with the world. So we present it at conferences and/or write it up for scientific publication, so that the efforts DRC puts into our own dolphins’ and sea lions’ care can impact the lives of other animals, too. Examples of husbandry research include Ovarian Follicular Dynamics (exploring a method for determining ovulation for artificial insemination), and Fetal Echocardiography (monitoring a calf’s heart in-utero).